It's common to have so much on your mind at the end of the day that it feels almost impossible to get a restful sleep or even find a moment of relaxation. We wind ourselves up either with work, life or both — and oftentimes can find ourselves in pricey situations trying to alleviate that stress. Check out this Breethe Meditation & Sleep app instead — it's been selected as one of Apple's best new apps across 95 countries, and delivers easy, intuitive guided meditations for even the busiest, most doubtful folks. In just a few moments, you can relax, sleep better and bring mindfulness into your daily life, whether you're wrestling with financial stress, relationship worries or insomnia. The app offers hundreds of short, effective guided meditations for any situation you find yourself in. Breethe also delivers inspiring talks, bedtime music, and stories to help you drift off to a deep slumber and offers gentle wake up tracks to help you get your day started on the right note. The app is compatible with both your phone and your laptop, so you can center yourself wherever you are. Breethe makes it possible to relax (even as a short break during your work day) with breathing exercises and soothing music. 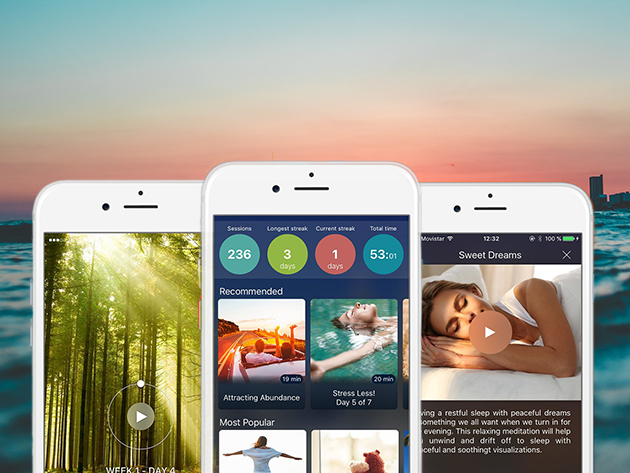 Take a moment for some self-care: usually, a lifetime subscription to this Breethe Meditation & Sleep app is $399.99, but you can get it now for $99.99.